Despite the metals reversal of fortune this past week, the coin market remains as healthy as ever. The Higher Denomination Wholesale Price Guide exhibits a considerable number of advances this week due to buyers raising their bids. Early Gold again leads the way, especially in Mint State grades. Some dealers are looking for several uncirculated coins for their customers. This market has plenty of depth. Deep Mirror Prooflike Dollars continue to move higher in grades MS64 and higher. 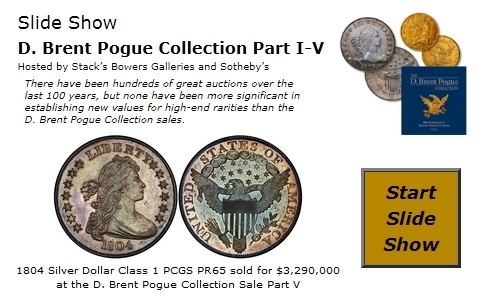 Dealers are looking for the scarce issues for advanced collectors who are willing to pay the price for these high grade rarities. New higher bids by one of the nation’s top market makers have a tendency to bring some of these coins out into the market. In the last month, the 1903 in MS65 DMPL has advanced over $5,000 wholesale. Many of the generic Gold issues, especially $5, $10, and $20 show some declines this week because of lower bullion. Gold has dropped nearly $100 since last week’s high. However, we are still finding many advances for rare issues that come on the market and realize prices much higher than previous levels. Early Twenties with low populations are in strong demand.